In 2009, Junior League of Tulsa (JLT) member Cassie Barkett started a conversation with a friend, Wendy Gray, which would evolve over the next six years to turn them into business partners and entrepreneurs. Both recreational golfers with spouses and children who also play, they noted a shared disdain for the lack of stylish women’s golf apparel. “The clothing out there is just terrible for women in the golf world, and we thought, ‘Why don’t we design our own?’” Barkett says. 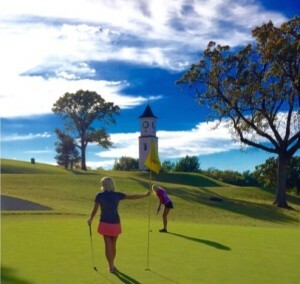 During the ensuing years, the subject of designing their own line of women’s golf apparel was a recurring conversation for Barkett and Gray until they finally decided to take action. 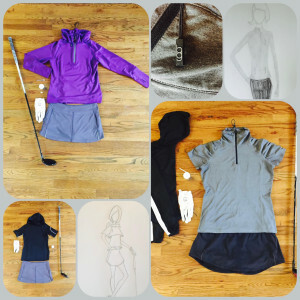 Eponymously combining their last names, the duo created Bar Gray—approaching their new business endeavor with the aim of designing modern, flattering, feminine clothing for female golfers. From sketching designs to negotiating with manufacturers and from reviewing contracts to financing the business, Barkett and Gray do it all. Gray, a personal trainer, and Barkett, an attorney, are able to draw on their respective professional backgrounds. From sketching designs to negotiating with manufacturers, Barkett and Gray handle all aspects of their business. The duo has attended textile shows to find just the right fabrics. Additionally, they have gone through manufacturers in a variety of countries to find just the right one. Currently, Bar Gray is producing its clothing via manufacturers in dual countries. They utilize American operations based out of Atlanta for custom fabrics, while most of the sewing is done in China. They are now preparing for the next step for their apparel line—getting it in pro shops and retail stores. In January, they will have a booth at the PGA Merchandise Show in Orlando. The event showcases the latest trends in golf equipment, technology, and apparel. Bar Gray’s first round of inventory will consist of eight to 12 pieces of women’s apparel, primarily tops and jackets. As far as being locally available, they are hoping to have merchandise in the pro shops at country clubs in the Tulsa area in the spring of 2016. Additionally, they’ll be shopping their line to pro shops at the public courses in the area, and they might have a pop-up storefront from time to time. The clothing also will be available on Bar Gray’s site. They hope to be accepting pre-orders beginning in January 2016. Barkett was quick to cite her experience in JLT as an invaluable resource during the process of launching Bar Gray. She joined JLT in 2000 and served as JLT president from 2010–11. She is currently a sustaining member. For more information on Bar Gray, check out their Facebook or Instagram page.